Using doPDF, everyone from novice users to professionals, can create high-quality searchable PDF files, by simply selecting the "Print" command from virtually any application. With one click you can save your Microsoft Excel, Word or PowerPoint documents or perhaps your emails and favorite web sites, into easy to share PDF files. You can create fully compatible Adobe PDF files from any Windows application that supports printing. There is a single installation file that automatically installs doPDF. Also there is an uninstaller utility that automatically uninstalls doPDF. You only need Windows 2000/XP/XP x64/2003 Server/2003 Server x64/Vista/Vista x64 and approximately 10 megabytes of free disk space. You don't need to learn a complex program. All you have to do is to click Print from any application that supports printing and choose doPDF to create PDF files. 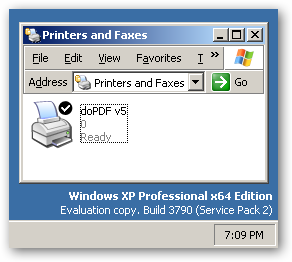 doPDF converts any type of printable windows document including DOC, XLS, PPT, HTML and TXT. You can search and extract text from the generated PDF files. During doPDF setup you can choose what languages to be installed for doPDF user interface. You can change the language at runtime.